The sweet gooseberry (Ribes uva crispa, Ribes grossularia) is the fruit of a bushy plant native to Europe, parts of Asia and Africa. Gooseberries are not only a sweet-sour culinary delight, but also a rich source of antioxidant polyphenols such as anthocyanins and flavones which contribute immensely to our good health through their antioxidant, anti-inflammatory, antimicrobial and anticancer properties. The polyphenolic compounds in the fruit are known to reduce inflammation levels in the body, delay aging and counteract free radical damage caused by reactive oxygen molecules. Moreover, gooseberries contain good amounts of vitamin C, a potent natural antioxidant, antibacterial and anti-aging vitamin, known for its immunity-boosting properties as well as for its role in preventing chronic disease. Vitamin C reduces free radical damage to cells, playing an important part in chronic disease prevention. It is also a key nutrient for collagen synthesis and contributes to skin elasticity, delays wrinkles and has a hydrating effect, ensuring a more youthful appearance. What do gooseberries look like? Gooseberries look very much like furry grapes. They may be slightly round or dewdrop-shaped and range in color from bright to deep green, yellow and purple-red. Gooseberry skin is full of tiny hairs and light-colored veins which help distinguish the fruit from regular grapes. The flesh of the fruit has the same color as the skin and is somewhat transparent or translucent. Each gooseberry contains several tiny edible seeds. On one end the fruit has a small tail, while on the other a sort of tuft-like top. Both are usually removed prior to being sold. What is a gooseberry? In simple words, a gooseberry is a grape-like fruit of a plant with the same name. Gooseberry bushes are highly resilient plants: they can survive extensive periods of drought and thrive in poor quality soils. As long as you protect young plant from frost, you should enjoy a good gooseberry harvest despite not giving the plant much attention. What do gooseberries taste like? Unripe gooseberries are pretty sour so they are usually sprinkled with sugar before being eaten. Considering they are firm, they withstand cooking well which is why they are usually added to tarts, pies and other similar recipes. Although ripe gooseberries are usually sweeter (and red-purple in color), tart varieties exist as well. Nevertheless, it is good to remember that cooking the fruit greatly reduces their vitamin content and health benefits. Vitamin C is particularly sensitive to cooking heat. The sweet varieties are commonly known as dessert gooseberries. They can be eaten as such or made into a fragrant summer fruit salad. Taste perception differs from person to person. 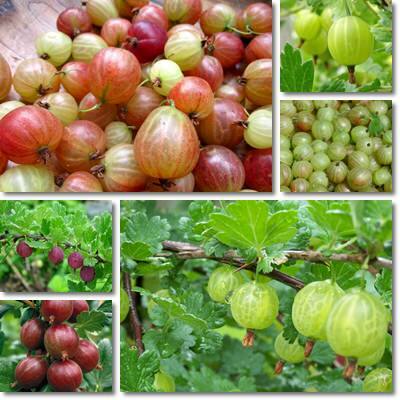 Consequently, some people describe gooseberries as having a strawberry or plum taste, others find them very much like grapes and currants together. I think they are quite fragrant and sweet, although I once came across some pretty sour berries. 1) With only 40 kcal/100 g of fresh fruit, gooseberries are low in calories and thus ideal if you are looking to maintain a steady weight. Substituting regular candied-snack with a cup of gooseberries will not only help you lose a bit of weight, but it will also provide good amounts of important vitamins, minerals and, more important, powerful antioxidants. 2) The fruit provides small amounts of all the important vitamins and minerals, notably vitamins A, C and B vitamins, copper, phosphorus, potassium, manganese and iron. Eating the fruit alone will not supply you with substantial amounts of all the important nutrients. However, gooseberry juice would make an excellent tonic because it concentrates more fruit pulp and consequently more nutrients per serving. From a nutritional point of view, gooseberry fruit are slightly more nutritious than apples and grapes. 3) Gooseberries are a great source of vitamin C (46% of the RDA), one of the most potent antioxidant, antibacterial and anti-inflammatory natural substances known to man. Having enough vitamin C in your diet is proven to delay aging signs such as wrinkles and boost immunity by increasing resistance to colds and infections. More important, vitamin C is a major anti-inflammatory recommended by reputable researchers as a prevention method for chronic diseases such as cancer, diabetes and heart disease, all of which are preceded by a significant increase in blood inflammation markers. In addition to this, vitamin C protects the integrity of our blood vessels and skin, increases the aggressiveness of white blood cells and accelerates wound healing. 4) With 10% of the RDA of vitamin A, gooseberries contribute to maintaining good eyesight. However, what makes the gooseberry fruit so healthy is its high antioxidant content. Polyphenols such as tannins and anthocyanins offer antioxidant protection and prevent cell damage caused by reactive oxygen molecules called free radicals. 5) Aid digestion and favors colon health. 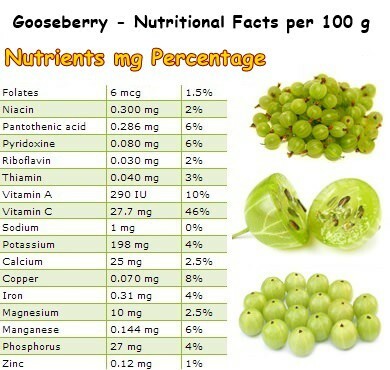 Last but not least, the gooseberry fruit is 87.87% water and contains 4.3 g of dietary fiber/100 g of berries. Not only does it hydrate us, but it also contributes to good digestion and promotes colon health. Moreover, the generous dietary fiber content of the fruit helps relieve constipation and better manage hemorrhoids. Which other fruit comes the closest to having the healing properties that gooseberries have? Hello Esther! There are many fruits that offer the same healing properties as gooseberries. Grapes, for example, have about the same nutritional profile, plus resveratrol. (Black and red) Currants are quite similar as far as their nutritional profile is concerned. Blueberries, blackberries, aronia berries are excellent choices as well. I recommend you go to the menu above and have a look at the Foods Map page, Fruits section. There you will find all the information you need to help you make the right choices for you.